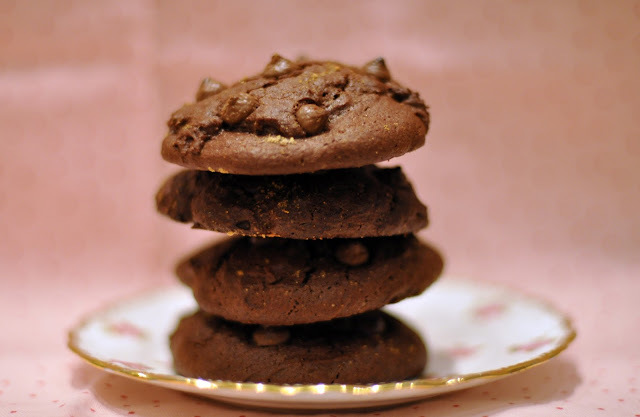 The fiery warmth of ginger and bittersweet dark chocolate is the most perfect cookie flavour. These are cookies with attitude! I saw this recipe on Milli's Kitchen yesterday and have been thinking about it ever since. I ran to get supplies straight from work and started baking immediately. As I have a little (large) soft spot for ginger I upped the spice to give a little kick. Melt the chocolate and butter in a plastic bowl in the microwave or over a ban Marie until fully melted and smooth. (Approximately 1 minute in the microwave). Beat together eggs, ginger and sugar until pale and light. Add the chocolate and sugar mix together, mix well. Stir in self raising flour, salt and cocoa powder. Stir until well combined. Dollop mix onto a baking sheet leaving space for the cookies to spread. Sprinkle with ground ginger and chocolate chips. Bake for 12-14 minutes depending on thickness of cookie. I really love the look and sound of these, I am a big fan of chocolate and ginger myself. I have never used ginger purée though - is it easy enough to get hold of? Just picked it up in Sainsbury's as I couldn't find any ginger syrup that the original recipe asked for. I got a box of sachets of the paste and used 2. Maybe I should change my ingredients list?! Definitely recommend them though, they got munched pretty quickly! Ah I have seen this range in Sainsbury's, I have to endure the weekly shop there tomorrow so will keep an eye out. Cheers!